The De Havilland Otter float plane took off in a roar, lifted from the river into the air, and disappeared behind a hill. A few moments later, the plane’s noise vanished altogether, and we were left alone in the wilderness, above the Arctic Circle, in Nunavut, Northern Canada. The silence was deafening. Six men, two raft boats, twelve days and a hundred kilometers of river to float and fish. What a perspective! I had flown all this way from Europe, curious to fish for that anadromous fish rarely sought after by adipose aficionados, the majestic arctic char. 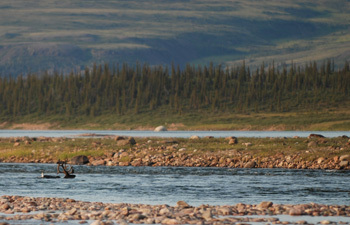 This exploratory trip was organized by GetAway Tours, a Danish travelling-and-fishing company. It was the first time the company organized the trip, so the tour leader Kim Jørgensen was both anxious and excited about the fishing we were to meet. We were going primarily for the large char that were said to run up the river, but we expected also to get by-catches in the form of lake trout and grayling. When we were ready at 9:00 PM, we ate one of these quick dry-food lunches Kim had brought. We quickly agreed that these were very practical: no dishes to wash and ready in an eye-blink…I then headed to the river along with my travel companions, full of expectations. The first half-hour was laborious, as I had to get back in my Skagit casting rhythm, after a year’s break. But after a while I got decent casts out of my fourteen foot rod, and could fish efficiently. In the middle of the run I had chosen, I got a pull, but the fish decided not to stay with me, and threw the hook after a few head jerks. Geeees’, the adrenaline was pumping in my whole body. Unfortunately that was all I felt that night, and my partners went back to camp with the same conclusion: no fish around. We decided to go to bed and save energy for the next day of fishing. Bothered by bugs in my tent early the next morning, I woke up and, after a quick breakfast, hit the run close to camp. Without success again. Even though the place was remote and pristine, that first failure of catching a fish reminded us that we would have to work hard for each fish. I started to think about the good advice that my friend Peter had given me before leaving: “Fish the areas downstream from a tributary, even if this tributary seems small in comparison to the main flow”. We located such a tributary about one kilometer above camp, and decided to walk up there to give it a shot. Kim was hoping to land a char over 5 kilos over this trip; it would set a new personal record for him. That feat he achieved quickly: he was the first of us with a bent rod, and after a muscular fight, landed his first arctic char of the trip. That fish set a landmark for the size we might expect in the next days: it was a beautiful female, measuring 35 inches and weighing an estimated 18 pounds. Wow, what a good start! The mood in the team rose with that nice catch. In order to cover the water more efficiently, Leibby (the only non-Danish of the trip; he was from Iceland) and myself crossed the river in order to fish the spot from a different angle. It turned out to be a great idea, as I was lucky to land my first fish, and then quickly landed an additional two. Great feeling, it was good to be back in the game! Leibby unfortunately did not manage to land his first char, but had contact with two. During the course of the day, everybody got their first char. All catches happened in a much localized area of the river, from the tributary’s mouth, and some 100 meters downstream. It confirmed the theories we had heard before: the fish concentrate in specific areas of the river. Once you have identified these places, the fishing becomes easier. We went to bed with a good day of fishing behind us, in the best of conditions (at least for the fisherman): high sun, nice temperatures and only a slight breeze. I was relieved to have a good feeling with all people in the party after that first full day of fishing: no one was egocentric, over-confident or unsocial. The coming ten days of the trip promised to be great. The next morning we packed the camp and loaded the boats for the first float, which would bring us to the next hot spot where we would set up camp. It turned out that there was quite a distance between these hot spots. 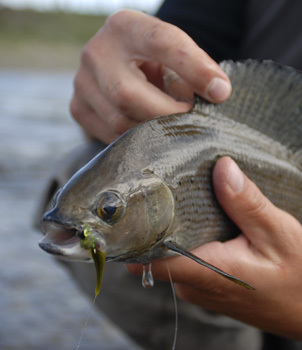 We did stop below a few tributaries on our way, but these proved to be fishless, at least when we were there. On our way down, we were hoping to see wildlife, but apparently the animals spotted us before we did. We managed to observe a large bull moose from a distance, but unfortunately the wind was blowing in the wrong direction. He trotted away from us, nostrils pointing upwards for more olfactory information. We also saw a few isolated reindeers, but it seemed like the main herd had migrated further north. Same for the king of the northern tundra, the musk ox, which we never got the chance to spot. After having floated five miles from our initial camping spot, we passed a narrow part of the river, where the water became fast and furious. The skills of our two oarsmen were tested seriously through that canyon, but in the end we came through without much arm; just a little water onboard. This area is not very popular among canoe enthusiasts; most of them decide to carry their floatation device around that white-water hell. After coming through the canyon, we came across a larger tributary, and when we floated close by we saw several massive char darting into deeper water. We were quick to jump out and start fishing from shore. Robin got a beautiful male char within a few casts: it was all red, with perfect fins, and an impressive jaw. Then everything went very fast: everybody caught char within 10 minutes of angling. Often two fishermen would have fish on at the same time. I think that among us 6 anglers, we caught about twenty fish within two hours of fishing, the smallest fishing measuring at 28 inches! The largest taken was about 34 inches. This proved almost too good. We supposed that the fish liked the place because it was the first calm pool they met after a series of quick rapids downstream. Despite the good fishing, we decided to move on, as the area did not offer good camping opportunities. We continued the float until we met another large tributary. On the banks of this tributary, there was soft grass waiting for our tents. We set up camp, and could relax after a full day of discovering new horizons. We had our usual “gourmet” dry food, sitting on the high bank with a nice view of the area. There was no breeze to chase the mosquitoes away, but apart from these tundra terrorists we really enjoyed the peace of this far away place. Like for each stop, we baptized the closed pool “home pool”, and gave it a try before hitting the bed. A large stone out in the stream proved to be a fish magnet, and each one of us in turn managed to make contact with fish. I was really enjoying catching these large char, it felt like steelhead fishing: big water, long Spey rods, large flies, solid pulls and beautiful fish. I decided to continue fishing while others crept in their tents. At 11 PM, I lost my fly to the bottom, and seriously considered joining my snoring partners, but then decided to tie a new orange Intruder to my fresh leader. This proved to be a good idea. I waded quietly out in the river, preparing to fish once again the area behind the large boulder. 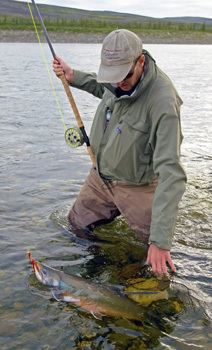 I was still lengthening my Skagit casts when the deep pull came out of nowhere, at the very end of the swing, just when I was getting ready for a new cast. I set the iron with a firm vertical movement of the rod. The fish seemed calm at first, and pulled steadily line from my reel. But as the first run kept going on, I started to worry and knew something big was on the other end of the line. This was confirmed when a gigantic fish leapt out in the current, some 80 meters downstream from me. I waded out from my position in the river, and started running down the river bank, as fast as I could among the large cobblestones. Leibby who was fishing below me, started to cast for that large jumping fish, ignoring that it had taken my fly. I yelled and he immediately waded out as well; it felt good to have somebody with me to help with the landing, should the char stay connected. I finally managed to get even with the fish, and could play it with better odds on my side. Time had become emotionally elastic; it felt like I had been fighting the fish for an hour now (later Leibby told me it was a matter of fifteen minutes…). I finally beached the monster. This was a beautiful male arctic char, with perfect red fins bordered by a white strip. In the right corner of its mouth, was my orange Intruder. I could see that the fish was big, but I was astounded when I measured it: 40 inches long, 21 around the waist, and an estimated weight of 27 pounds! What a stunning creature, potentially a new world record! I was so overwhelmed by my luck at landing this incredible fish, that I stopped fishing and enjoyed a cup of coffee while watching Robin and Lars throwing their last energy of the day in the stream. Amazing! Even in my dreams I had not imagined such large char! The next day the wind picked up, and the fishing became more difficult. We fished hard all day, and I managed to catch only one fish. The others did better, but in the evening the rain started to settle in. We got the visit from a young grizzly bear in camp, who seemed to stumble across it as it wandered over the tundra. Kim welcomed him by throwing stones in his direction, and off it took in the bushes. I was a little concerned about this episode when going to bed, so I made my pepper spray bottle ready, in case the bear would come back in the night. Next morning I woke up hearing rain drops on the tent. The sunny days were over I thought, too bad. We were reminded that we were very far up north, as the temperature dropped drastically. We decided to stay at the same camp today, and fished the various places around it. I tried my luck with the large graylings that were constantly feeding in the surface, and manage to catch a few up to 20 inches. Beautiful fish, freshwater’s answer to the sailfish! The others fished for char, and landed a few, but it felt like the fish felt our presence and avoided the area more and more. Therefore we decided to move on the next day. It was not a fun day to pack the camp, as it was still pouring down steadily. Late morning we put the loaded boats out, and didn’t really know where our next camping spot would be. The map showed several promising tributaries we could fish downstream from. We explored one after another, without any success. We were getting worried, as we felt we were floating too far down and risked to end up at the pick up point too early. But as one place after the other proved fishless, we continued our float, getting irremediably closer to the pick-up point. Buckets of water were still falling down, and we were remembered that we were closer to the North Pole that the Equator, when the temperature was nearing the freezing point. The boats went silent as we glided smoothly towards north. At the end of this fishless day, we did reach the pick-up point. Everyone knew that something was very wrong now: we had come here five days before the end of the trip. We had been told that there was a hot spot below a significant tributary, some eight kilometers downstream from the pickup point, so we were really counting on that spot for the rest of the trip. We had tried to convince the bush pilot to come and get us down there, but apparently the river is very wide, and hence too shallow for a float plane to land. How could we then handle the situation? We were too cold to think rationally and instead decided to build a bonfire to warm our frozen bodies, and to think things over during the night. Then camp was set up once again, and we all crept in our tents right away. In the morning, the weather had cleared a bit, and our minds as well. Kim decided to send a reconnaissance group of three, down to that famous hot spot, to see if it was worth spending several days there. Robin, Leibby and I were sent down to that famous place. We walked hard for two hours through harsh tundra vegetation. When we arrived at the hot spot, we were quite tired, and had to wade over the tributary that was running high. With each other’s help, we managed to get over it without getting too much water onboard. Then we started fishing. I quickly got a solid pull, and felt an intense joy, as I had gone fishless for the last two days! I landed the average sized char of about 30 inches. What a relief for the whole group! The place teemed with fish, Leibby and Robin also landed quickly fish in different parts of the area. I was fishing a pool wading deeply, when a fish took so hard that line peeled off the reel very fast. Unfortunately the reel handle got stuck in my fishing jacket, and the fish and I parted instantly with a pang: the leader had broken. Damned, that was a good one! 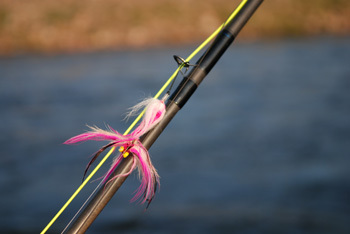 I fished on, and then felt a new solid tug on my pink Intruder. I fought the fish very hard, in order to keep it out of the main current. I managed to land it after a lengthy fight. 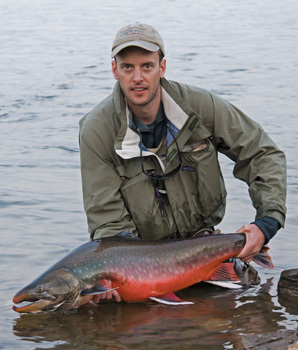 It was again a large male arctic char, 38.5 inches long by 20 around the waist, and an estimated weight of 24 pounds. What a fish, again! It was very well shaped, with an impressive jaw. A belly as red as the maple leaf of the Canadian flag! Leibby got some shots of the beast before a quick release, as we had to hurry down to Robin who was struggling with another large fish. We landed this as well; it was 36.5 inches long! What an amazing day! There was electricity in the air, it seemed like every fish in the river was turned on. We landed all in all 15 fish in three hours of fishing. We were so happy and relieved. That was probably the best fishing day of my life! We walked back as quickly as our exhausted bodies let us, with plenty of good memories in our minds. We were eager to tell the good news to our friends. On the way home, we surprised a large bald eagle, which took off just twenty yards from where we stood, and hovered over the river valley. What a magnificent sight! When we arrived in camp, Kim was eagerly waiting for news. He was very relieved to hear about our fantastic fishing day. As tour leader, he had considered all the options, including being picked up by the float plane before due time. That would have been a catastrophe for him, his employer, and us fishermen on the trip! We decided to float down with one boat only, packed with all the gear. We had to keep it as light as possible, since we knew that the last day we would have to pull the heavy boat back up to the pickup point, eight kilometers against the current. Two rowed the boat, while the rest of us walked down. When we reached the hot spot, we set up camp as close to the river as possible, directly on a cobblestone ground. Lars, Allan and Kim, who had not tried the place, were allowed to hit it first. While the fish were not as turned on as the previous day, they were indeed there still, and everybody enjoyed bent rods again. We spent another four days on the fishing spot, which proved to hold fish over a distance of more that 3 miles downstream from the tributary. Hence, we never fished on each other’s shoulders, and had plenty of water to play with. 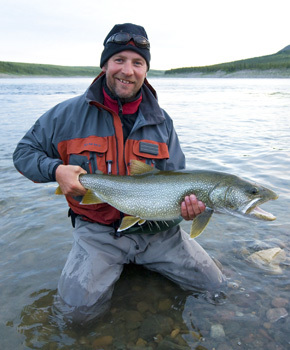 Robin even managed to land the trip’s largest lake trout in a deep hole, a beast 34 inches long. One day I decided to keep a smaller bright fish, in order to taste at least one time fresh arctic char. As I hauled it back in camp, we spotted a bear across the river. I was not too concerned, until Kim warned me that these animals have a fine olfactory sense, capable of detecting odors miles away. He asked me to butcher the fish well downstream from camp. I nodded, and went down, thinking that the bear would never smell my fish across the river. But… as I walked back to camp with my cleaned fish, the bear had crossed the river! Fortunately it did not come towards us, but he most probably came over because of the fishy smell. Impressive! I thoroughly washed my hands before going to bed, I can tell you! The last day had arrived: time to pack the camp for the last time, and drag the boat loaded with our gear, up to the agreed pick-up point. We knew it would be a tough job, and had planned to spend eight hours on it. Fortunately, we found a good technique of hauling the boat which kept it at bay so it didn’t bounce on the bank’s rocks. Combined with a sound and constructive collaboration, we managed to meet our final destination within four hours! It was a mix of regret and immense satisfaction that submerged me when I boarded the plane. Regret because I didn’t know when I would experience such magic fishery again in the future, and when I would fish with my companions again. Satisfaction because the camaraderie had been great, the landscapes breathtaking, and the fishery had kept its promises in term of fish size, number, and not the least, beauty. If you should have further question, you are very welcome to contact me at: nils@anadromousflyfishing.com. If you want to book such a trip with GetAway Tours, you are welcome to contact Kim Jørgensen at: kim@getawaytours.dk. More photos from the trip can be accessed here.